Research on the pleiotropic actions and consequences of the renin angiotensin system (RAS) and its many effector components remains fascinating and interesting because new surprises continue to emerge and provide fodder for further analysis and new experimental directions. The older paradigm was so straightforward and simple focusing primarily on the circulating RAS and a single effector peptide, angiotensin II [Ang II]. However, we now know that the system is much more complex exhibiting multiple actions of various active components via different receptors and utilizing various important enzymatic pathways. In this exciting new e-book by Dr. Casarini and her colleagues, a number of important new concepts are presented which further demonstrate the complexity of the RAS system and the many effector components. As pointed out in the first few chapters, evidence obtained during the previous one or two decades has led to an expanded view of the RAS serving paracrine, intracrine, and endocrine functions. Our attention is also directed to the findings that many other angiotensin peptides also exert bioactive roles. Several of the subsequent chapters then delve into the intricacies of the local tissue RAS activities focusing on the paracrine and intracrine functions of Ang II in the heart and kidneys as well as other angiotensin peptides including Ang 1-7. The more recently discovered components of the tissue RAS, including ACE2 and the prorenin receptor, are also integrated into the overall interactions that occur at the tissue and cellular level and also within the intratubular network in the kidneys. Our attention is then directed to a consideration of the complex enzymatic pathways that are responsible for the generation of the various angiotensin peptides. The roles of tonin, ACE and ACE2 and ACE polymorphisms are examined. Additional chapters discuss the novel developments related to the ACE2/Mas axis and how it influences formation and action of Ang 1-7, and our evolving concepts regarding the renin-prorenin receptor and their possible roles in regulating the local formation and activities of Ang 1-7 and the prorenin receptor. Completing the book, the remaining chapters deal with RAS related pathophysiology and the roles of immunity and inflammation activated by Ang II, the interactions with the nitric oxide system and catecholamines, and how emotional stress and exercise may alter the activity of the RAS. Finally, a consideration of how the activity of the RAS is modulated in animal models of hypertension and diabetes provides further insights on pathophysiological contributions of the RAS in disease states. In this e-book, Dr. Casarini and her associates have provided us with an outstanding array of topics which are covered in-depth and will be of tremendous value not only to investigators directly involved in studies of the RAS but also to all colleagues who are interested in obtaining a comprehensive appreciation of the current state of knowledge regarding the regulation and roles of the many components of the “modern” RAS. 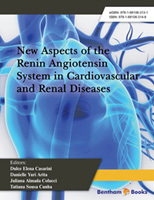 The idea of publishing a book on the new aspects of the renin-angiotensin system (RAS) in cardiovascular and renal diseases has been developed during the past few years. The need for a book that describes the new approaches of the RAS in the development of cardiovascular and renal diseases and the trend of future research became apparent. The book describes the important role of systemic and local RAS in the development of heart and kidney diseases and its relationship with the immune system, stress and exercise; as well as provides data on the biochemical and pathological changes in these diseases. Understanding the mechanisms of participation of this system in cardiovascular and intrarenal modulation can lead us to better understand the pathogenesis of diseases such as diabetes, hypertension and chronic renal failure. Even knowing the therapeutic interventions for these diseases, there are many challenges in integrating traditional medical literature and increased information of new technologies that facilitate the comprehension of the molecular and cellular mechanisms. We have been very fortunate to enlist a group of renowned experts in RAS research for this book, and very grateful to the dedication and contribution of our authors. We hope that book will be useful for researchers working in the field of the RAS.